Luongo was the king of the crease in Vancouver and holds a handful of franchise records. throne. That left the Canucks with two young and unproven goaltenders during the stretch run of the 2013-14 season. Those goalies were Eddie Lack and Jacob Markstrom. After Markstrom struggle immensely during his time as Lack’s backup in the 2013-14 season, the Canucks went out and with the help of their new management team signed veteran goaltender Ryan Miller to a massive $18 million deal. With Miller in town it seemed certain that Lack would be relegated to backup duty again. Oh but wait. 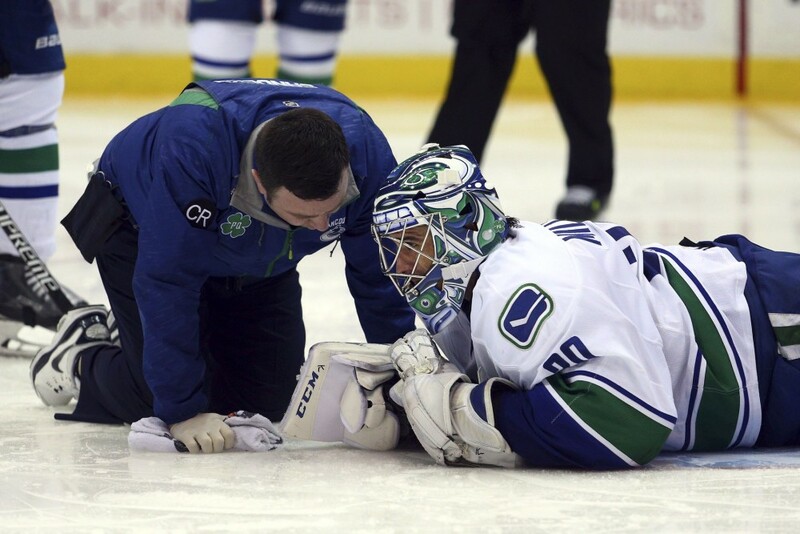 Heading into the most important time of the NHL season, Ryan Miller sustained a knee injury with an indefinite return. Queue Eddie Lack. 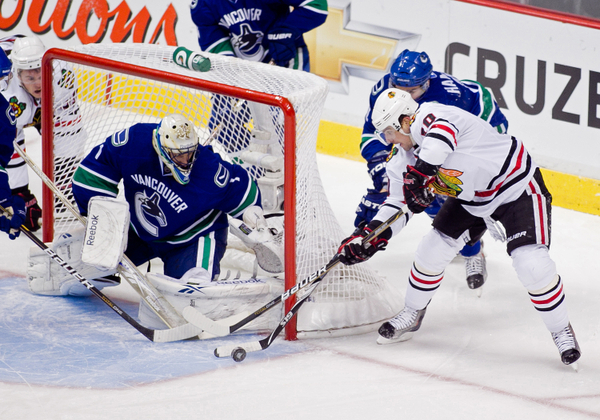 Lack came into the Canucks crease and was an integral piece of the puzzle that catapulted Vancouver into the second spot in the Pacific Division. He went 8-4-1 with a .928 Save Percentage. Not too shabby. Until the playoffs, where both he and Miller were lit up against the Flames. Regardless of Lack’s strong performance under pressure, the Canucks felt that Markstrom’s stellar play in the American Hockey League and Miller’s semi-proven track record were enough to make Lack the expendable piece of arsenal. On June 27th, 2015 the Vancouver Canucks finalized their future in net by sending Eddie Lack to Carolina and subsequently resigning Markstrom to a two-year one-way deal. As the 2015-16 season begins, it will once again be Miller’s net to lose, and at 35-years-old with a subpar debut season in Vancouver under his belt, Miller has every bit of proving to do as Markstrom. Miller was…bleh. Markstrom was awful, in the NHL, but unreal in the AHL. The combination of these two for a tandem season could prove to be explosively productive or catastrophically bad. For Miller these statistics are a bit two-faced. Although he accounted for 29 of the Canucks 48 wins in just 45 games played and had some incredibly solid performances, his personal statistics were a bit shocking. In twelve of his 45 games played Miller allowed four or more goals. His save percentage clearly shows those struggles. Beyond that it has been quite some time since Miller has had his best form. 2009-10 was the last season that Miller recorded elite stats. In that year he held a .929 SV% and a 2.23 GAA while winning 41 games out of 69. For Miller to return to form he will have needed to make some major adjustments to his game during the off-season. Unfortunately if Miller fails to improve on last year’s lackluster performance the Canucks have left themselves with a high-risk secondary option in Markstrom. At 25-years-old Markstrom has come from being one of the brightest young goaltending prospects in the NHL to being a player on the verge of falling off the pyramid so to speak. In parts of six seasons with the Florida Panthers and Vancouver Canucks organizations Markstrom has racked up just 50 games including only 13 wins. In those 50 games he has a career GAA of 3.19 and a SV% of .896. Not exactly reliable numbers. After being Florida’s future netminder for five seasons, the Panthers moved on after Markstrom struggled to prove himself as NHL worthy, time after time. With the Canucks Markstrom has continued his NHL woes but had a massive season in the American League posting 22 wins in 32 starts and carrying the Utica Comets to the Calder Cup Final. That AHL success and his personal commitment to changing his game to fit the NHL style earned him his two-year deal worth just over $1.5 million per year. At first glance this contract seems like quite a generous freebie for Markstrom to redeem himself and will surely be his last NHL contract should he not solidify himself as NHL talent. On that note, general manager Jim Benning committed to him for a reason and it’s not out of the question for a goaltender to come on the scene in his mid-twenties. Markstrom was drafted at the top of the second round by Florida in 2008 because he was looked at the most promising goalie coming out of Sweden at the time. When the Panthers shipped Luongo to Vancouver in 2006 the franchise was without a goalie to build around and when they landed Markstrom in the 2008 draft that problem seemed solved, at least in the long term. Finally Markstrom will be given an honest chance at making an impact in the NHL. Miller just can’t log 60-plus games anymore with his age so Markstrom will be relied on for at least 25 starts this season and if he does well to hush the naysayers, he might earn himself a starting position come 2016-17. Failure for Markstrom is not an option. The 13th and 14th forward spots are always questionable throughout the entire season. Different players, young and old, are given chances at getting NHL action through injuries and different systematic needs. For Vancouver the recent injury to Chris Higgins, which will have him missing the rest of preseason and possibly the first week of the regular season, has opened up a spot for someone to get some extra time with the big club. Moving directly into Higgins’ third line role will be Ronalds Kenins, rounding out the line of Bo Horvat and Jannik Hansen. Kenins move into the lineup opens up a spot for a different player to grab the 13th spot. Some quick names pop up as possibilities for that roster spot: Alexandre Grenier and Adam Cracknell. Cracknell has years of AHL experience and has been a fill-in player for most of the NHL clubs he has worked with while Grenier has had two consecutively productive years in the American League and is a big body with solid offensive skills. It will likely be one of these players that gets some early season action with the Canucks, but there are a few other players that remain with the Canucks preseason team that have a chance at earning that time (Blair Jones, Jake Virtanen for less than nine games). On defense there is no question who will be getting the 7th spot, Frank Corrado. Corrado has struggled to produce in his 28 NHL games but has displayed his dazzling puck control and solid positioning. Another year of AHL duty, a deep run in the Calder Cup playoffs and another offseason of growth has Corrado primed to make some noise this year. Corrado will battle with Bartkowski for the 6th spot throughout the year.